McIntosh High School students and sisters Twins Jacqueline and Caitlin van Zyl show off the fourth place ribbons they won in computational biology and bioinformatics on their first trip to the Intel International Science and Engineering Fair. Photo/Submitted. 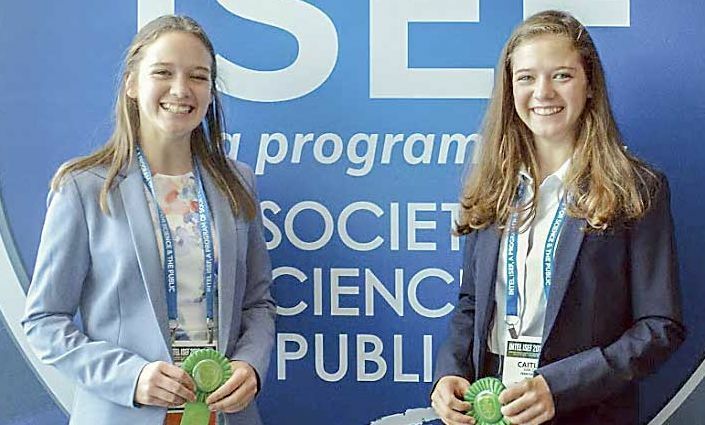 After their brother took his first trip to the Intel International Science and Engineering Fair (ISEF) last year, twin sisters Caitlin and Jacqueline van Zyl followed in his footsteps a year later, and like him, they wowed the judges and brought home a top award. Above, McIntosh High School students and sisters Jacqueline and Caitlin van Zyl show off the fourth place ribbons they won in computational biology and bioinformatics on their first trip to the Intel International Science and Engineering Fair. Photo/Submitted. Caitlin and Jacqueline, students at McIntosh High, won fourth place with their project, “Experimental External Neural Pathway for Motion in Stroke Victims,” in the computational biology and bioinformatics category, netting them a $500 award. They were among six finalists from the United States to receive a fourth place award in this category. The sisters competed against high school students from throughout the United States and countries around the globe at the 2018 Intel ISEF. Only 13 students won awards in the computational biology and bioinformatics category, and just 600 of the approximately 1,800 competitors from more than 75 countries received awards and prizes for their innovative research. This marks the second consecutive year McIntosh has had students place in the Intel ISEF, and for the van Zyl family, it is also their second consecutive year bringing home a victory from the fair. Last year Robbie van Zyl won third place in the engineering mechanics category. Millions of students worldwide begin their journey to the international event by competing in local and school-level fairs where the winners move on to regional and state competitions. Students from these competitions with the best projects win the opportunity to attend the Intel ISEF. Caitlin and Jacqueline were selected to participate after taking top honors at the 2018 Griffin RESA Regional Science and Engineering Fair.